Kenya's forests are in terminal decline. The communities are needing to survive and so they go to the bush to find resources. 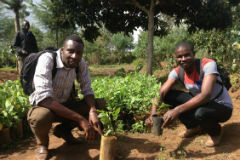 The Kijani team are developing a plan to get a long term, sustainable reforestation programme underway and plan to use Foundations for Farming (FfF) techniques to achieve this. Continuous forest cover has reduced by over 75% since 1980. Many of the youth at Kijani Forests for Change grew up traversing sprawling tree-laden hills as they travelled to their ancestral homes. A large swath of these forests are now gone and the water supply of the entire East African region is at risk, decreasing agricultural yields and destroying the unique biodiversity. In addition, the youth employment rate in Kenya stands at approximately 40%. Rural areas in particular have few to no prospects for young people, and slums are growing incessantly. Attractive development opportunities in rural areas are therefore crucial for sustainable and self-determined development. The soils are rapidly degrading and the Kenyan population is rising by approximately one million people per year. The cost of food production has gone up as more food is needed to sustain the rising population. Over the past decades, the main inhibitor to food production has been unsustainable farming technologies. 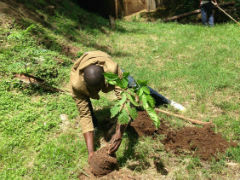 Kijani sees an opportunity in the degraded forest areas. They believe that young people have the capacity to build innovations that will propel sustainable economic empowerment by linking the challenge of climate change with socio-economic opportunities for rural communities in Africa. Kijani was formed in 2013 by passionate youths who have a desire to impact young people in Kenya. Statistically over 60% youth unemployment rate has been experienced and this is a waste of human capacity and potential that can be channelled to a greater cause. They felt strongly they wanted to do something about this through an initiative to promote environmental restoration. "We love our country Kenya dearly and want to see its forests restored. We aim to do this through a sustainable model where forests are rehabilitated and youth empowered." BHW has been in partnership with Ibrahim Omondi and DOVE Africa since 2013 (KEN07) and BHW's Field Director has met Daniel (Ibrahim's son) three or four times in the intervening three years culminating in this project being presented in 2015. Initially 30 families and then a further 30 who will be taught Foundations for Farming. This will have applications for them outside this project. Over time, from year to year the number of people trained will increase. The community will benefit as well as the families becoming self-sustaining. These families are mainly rural peasant farmers with few ideas about how to farm well and be productive and efficient. The first draft of the Kijani project was rejected as not being feasible. There were just too many loose ends and unrealistic aspirations. This version has real potential. It is realistic in size with 30 farms participating. Reforestation could be huge and not sustainable. It has the opportunity to develop strong relationships into the community and on the back of that, there is real potential for church planting. This is further enhanced by the partnership between DOVE and Kijani. The key person has a job so does not have to live off the project. 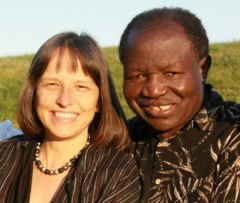 DOVE Fellowship is an existing partner and Ibrahim and Diane Omondi are the principal people involved (Ibrahim is chairman of the Kijani board). Along with them, Jesse and Francis are the Foundations for Farming trainers whom BHW trained in Zimbabwe and whom John Vlaming has worked with in training so we have confidence in them. Daniel Omondi (Director) is Ibrahim and Diane's son and is a writer and social entrepreneur. He is the prime mover and overseer of operations, providing strategic direction and mentorship. "Working with UN Habitat has inspired me to use my bicultural experience and writing skills to advocate on behalf of marginalized youth in Africa." Daniel studied in the USA. David Oyaga (Manager of Community Engagement) is the community worker with Kijani based in Nairobi. He is in charge of community operations, e.g. developing relationships with local stakeholders and overseeing community work. "Communities cannot be developed. They can only be empowered to find adapted solutions to their own problems. This is what I desire to do." Tobias Lohse (International Coordinator) from Germany - designer and developer. He coordinates with parties outside of Kenya, e.g. research students, volunteers and donors, who express interest in supporting the work. "Living in Kenya has inspired me to use my organizational and design skills to creatively promote social justice and fight climate change." Erick Ogallo (Manager of Forestry) is in charge of development and implementation of the tree-planting strategy, which includes an agro-forestry model for Phase 1 of the project. Most of these young people met while studying in the USA or back in Kenya. 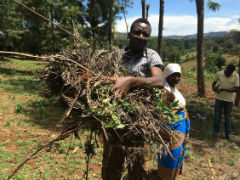 To integrate Foundations for Farming into the Kijani forest restoration programme as a way of achieving sustainable forest management and at the same time providing livelihoods for small holder communities in North Marmanet. This is a pilot project to test the viability of this agro-forestry model. Many attempts have been made in the past to replant Kenya's dangerously depleted forests. In some cases, millions of dollars have been put into tree planting but there has been little success. Local stakeholders have to somehow be brought into the process and be able to develop sustainable lifestyles while the forest is replanted and as it regrows. Until now this has not been achieved anywhere with long term success. 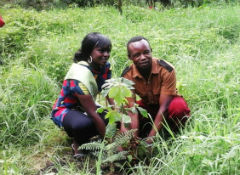 DOVE Christian Fellowship recently signed a lease agreement with Kenya Forest Service to utilize 100 hectares of land in North Marmanet Forest in the central Kenyan highlands for a reforestation project. Kenya Forest Service has further agreed to allow agro-forestry to take place as local farmers are given land for farming (maximum allocation per family is set at 1 acre for a 3-year period). The idea is that after 3 years the trees will be sufficiently established to continue to grow unaided and then the family will be given another 1 acre for a further 3 years to continue increasing the land area. With high youth unemployment and a strong desire from the local population to have access to farm land, the opportunity for a sustainable forestation effort is both promising and unique. Kijani (partnering with DOVE Christian Fellowship) will organize a four-day ecosystem-based Foundations for Farming training which is aimed at giving local farmers the knowledge and skills needed to revive the soils, increase food production, reduce food production costs and conserve biological diversity of the North Marmanet Forest in Laikipia County. Including economic benefits through climate-smart agriculture for the rural poor can ensure the long-term goals of this reforestation effort. They are searching for low-cost innovations that spread the responsibility and benefits of forest rehabilitation to local communities. Synergies between the ecosystem and sustainable business models generate tangible economic benefits for the community and give the forest a lasting value. Ecosystem based adaptation (aka Foundations for Farming) provides flexible, cost effective, and broadly applicable alternatives for building robust food systems on less inputs and reducing the impacts of climate change. Promoting agro-forestry, barrier crop use, and conservation agriculture will result in more fertile soils and increased yields. The Foundations for Farming training workshop will be for community members in North Marmanet who belong to the Community Forest Association (CFA), the target being the young people and some community women and men. The training will be held with an initial group of 30 selected farmers and then six months later, in preparation for the subsequent rainy season, with a second group of 30 selected farmers. Follow up visits from the trainer and a Kijani staff member will help ensure that the method is being implemented. The plan is that the local people will become sustainable very quickly from the land using Foundations for Farming processes. There will be an ongoing need to continue training from year to year until it is able to be funded from within the project.